Many people interested in Miramichi Atlantic salmon have heard of “CAST” or Collaboration for Atlantic Salmon Tomorrow, but most people are probably still not aware of exactly what CAST is doing to help Miramichi salmon not only survive, but hopefully to once again thrive. As background the CAST program was conceived by bringing together a diverse group of representatives from government, higher education, industry, conservation organizations, and private business. These partners include the University of New Brunswick, The Miramichi Salmon Association, The Canadian Rivers Institute, J. D. Irving, and Cooke Aquaculture. In my view this is a smart concept, because in addition to the diverse and unique resources these established organizations bring to the table, by going forward together the collaboration eliminates in advance many of the conflicts that normally occur any time one organization tries to do something on its own. While the CAST partners have already made several important advances – like the installation of special ARIS sonar devices on both the SW and NW Miramichi rivers to count returning adult salmon – the Smolt-to-Adult Supplementation (SAS) conservation strategy portion of the CAST program is their proactive initiative to supplement the number of adult salmon spawning in the system. I especially like the fact that it is proactive rather than a plan to act only after the population totally collapses. Many of us who are not fishery biologists get frustrated simply hearing only that more study is needed. Certainly there is more that must be learned about Atlantic salmon and the environment in which they live, and that process can never stop. But many of us are concerned about losing the fisheries that we have now before we get beyond the study phase. That concern is well founded when you realize that we have already lost every river in the Gulf of Maine and the Bay of Fundy as places to fish for Atlantic salmon. During 2018 even the exhaustively monitored and studied Magaguadavic River in New Brunswick joined the list of salmon rivers that are functionally extinct. 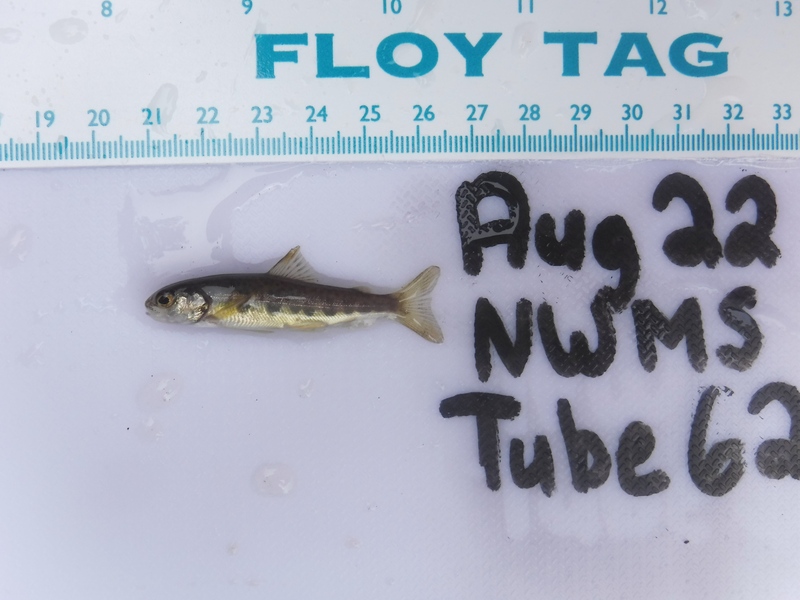 Atlantic salmon fry captured in the Experimental River in August 2018. DNA analysis to determine the exact parentage is currently underway. CAST has a plan, and intends to implement a concrete solution that within a short while could have a significant positive impact on the Atlantic salmon population of the Miramichi system. This is applied science, and with the Miramichi salmon run in recent years consistently failing to meet minimum spawning conservation requirements there is definitely an immediate need for it. The SAS strategy is to first capture outward migrating wild Atlantic salmon smolts in the Miramichi catchment and rear them to adulthood in the Miramichi Salmon Association hatchery in South Esk, New Brunswick. Just prior to the fall spawning season, during the year when these SAS adults reach maturity, they are released into the wild in the river from which they were captured as smolts. They are expected to then spawn naturally and increase the number of eggs deposited in the river. The plan was conceived by the collective wisdom of the scientists working for the various CAST partners, and among its advantages over traditional juvenile stocking methods is natural partner selection and the fact that the resultant fry will have been born wild in the streambed. The current salmon returns problem is not with the Miramichi’s spawning capacity or the condition of the river. The river is blessed with the greatest abundance of spawning gravel of any river in North America, and it is relatively pristine. Even with the lower adult returns of recent years the Miramichi is still sending a substantial number of smolts to the ocean each spring – the few needed for use in the CAST project are quite literally a tiny fraction of a drop in the bucket. Based on historic percentages of smolt survival in the ocean there would be no lack of adult fish returning to the Miramichi. The percentage, though, of smolts that live to make it back today is much smaller than even 10 years ago. We don’t know why. It is important that we do research, find out what is happening to young salmon on the high seas, and then do something about it. But it is also imperative that we keep sending a high number of smolts to the ocean so that if and when we do fix the problem our run is not already extinct, and also, so that in those occasional good years that still do come along – like 2010 and 2011 – that the Miramichi is still sending enough smolts to sea so that we take maximum advantage of those opportunities. Utilizing the SAS program to supplement what in most recent years has been an insufficient and declining return from the sea appears to be our best hope of doing that. In addition to the high seas mortality and changing environmental conditions that all salmon rivers face, the Miramichi has experienced a great recovery in its native striped bass population. When the striper population collapsed in the 1980s it was estimated that a good rebuilding target would be about 35,000 adult bass. We now have 1,000,000 more or less, and they are undoubtedly eating anadromous herring – gaspereau – shad, sea run brook trout, smelts and Atlantic salmon smolts. While it may not be fair or accurate to exclusively blame striped bass, all of these important fish populations have declined precipitously, seemingly in concert with the striped bass expansion. The First Nations people have been granted a small commercial quota for striped bass, and that fishery began during the late fall of 2018 on a somewhat limited basis. The recreational fishery for striped bass has been highly constrained by a restrictive slot limit that could be at least somewhat liberalized. The striped bass population may also prove to be cyclical – as it is on the East Coast of America – and it could decline somewhat naturally. Right now, though, the percentage of Miramichi smolts making it out of the river to the ocean is substantially less than other New Brunswick salmon rivers – like the Restigouche – that had similar smolt escapement statistics to the Miramichi before the striped bass population grew to its current level. The SAS program is hoped to be a temporary measure to bolster the number of spawning adults during these troubled times, and many people in the Atlantic salmon community feel that it is probably the best conceived plan that exists, and that we need it right now. Beginning in 2015 the CAST team was given a permit by the Department of Fisheries and Oceans “DFO” to collect wild smolts, and a permit for smolt collection has been granted each year since. It was understood that the first adults would be available in 2017. When it came time to release the adults the DFO was not willing to let that part of the program go forward as originally planned. The reason given was that a final peer review had not yet been completed. That review was completed early in the winter of 2018, and with a few manageable caveats it reflected positively on the SAS concept. When the fall of 2018 rolled around, and the several hundred adult salmon were nearing a readiness to spawn, permission to put them in the river was again denied. No clear reason was ever given, except that proper consultations had not occurred with First Nations. Before next year rolls around, though, some very capable people are trying to work with First Nations, and everyone is now operating under the hope and expectation that in the fall of 2019 DFO will grant the needed permits. CAST was allowed to introduce a limited number of adults into a so-called Experimental River “ER” in both 2017 and 2018. The section designated for this work is called the NW Millstream. This stretch of river was chosen as the ER because while it at one time was used extensively by Atlantic salmon for spawning and juvenile rearing, but for years the river had been blocked by an industrial dam. The dam was later removed but the wild population there has never fully recovered. Also, the Mill Stream is very close to the estuary, and rather remote from the more important spawning and nursery grounds located further upriver. Conditioning area before entering the experimental river “ER”. 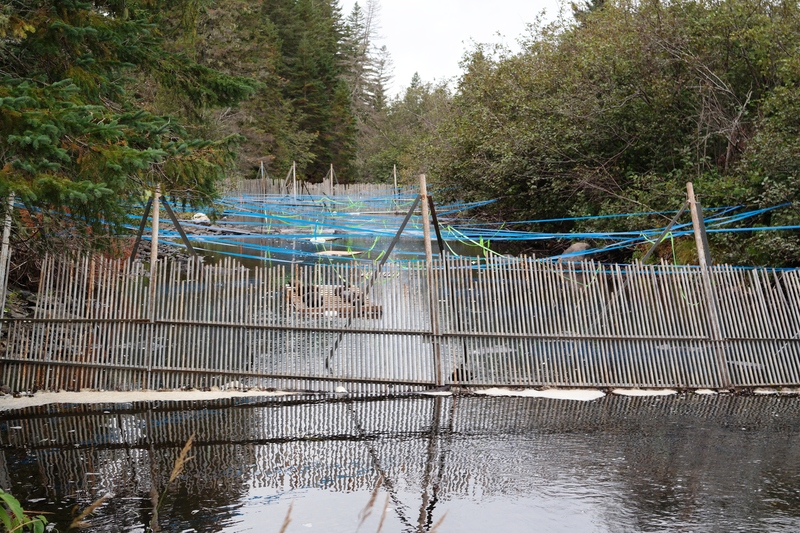 Prior to the release of the SAS stock a barrier fence with an integrated trap was installed to catch wild Atlantic salmon migrating into the experimental section. All fish destined for the ER are first released into a sealed-off site (60m) within the ER. This site is used as a conditioning area for the fish after transportation and tagging. Instream structures are installed to provide cover and hiding spots. The fish remain in the “conditioning” area for at least 4 days prior to their final release into the larger ER area. The goal of the ER project is to learn how successfully the SAS adults are able to reproduce in the wild both with themselves and with wild fish that they may encounter. The project is also expected to show how well the resulting fry fare in the river compared to totally wild fry. The SAS techniques have already been used successfully in other rivers in the United States and Canada. 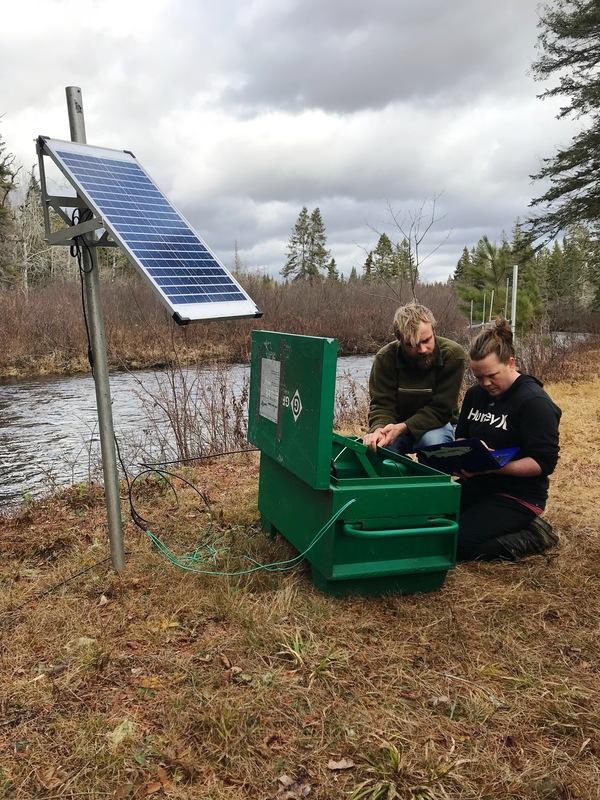 The Upper Salmon River in Fundy National Park, and the Saint Mary’s River in Nova Scotia have both recently undertaken versions of the SAS program. Importantly, DFO has operated a SAS program in the Tobique River in the headwaters of the Saint John since 2003 that is similar in scale to that proposed in the Miramichi. Stocking there often exceeds 1000 released SAS adults. Because the ER provides a somewhat observable environment with controls over the fish that are allowed in and out a lot can be learned that would not be possible in the expansive, overall Miramichi River system. Every enhancement situation is somewhat unique. The Miramichi salmon population is not at the point of extinction, and this provides the Miramichi CAST SAS program with the great benefit of being able to gather completely wild, native smolt stock specific to the river. Information from the ER will allow the CAST scientists to fill gaps in scientific knowledge about spawning behavior, post spawning behavior, and the survival of the eggs, fry and parr at various life stages for both SAS adults mating together and SAS adults mating with wild salmon. In fact a lot has already been learned. Conclusive answers to these questions are in the making, but it is already a proven fact that the purely wild and SAS adults mated in the hatchery produced viable fry that are indistinguishable from those produced by mating totally wild adults. 2017 20 male and 20 female adult SAS Atlantic Salmon were released into the ER in the fall of 2017. The permit granted in 2017 only allowed the collection of wild fish within the NW Millstream. Due to the late approval of the project, and the extreme low water conditions during the autumn of 2017, no wild adult salmon were collected or migrated into the ER section naturally. Hence the important reference group of wild fish was not part of the experiment in 2017. 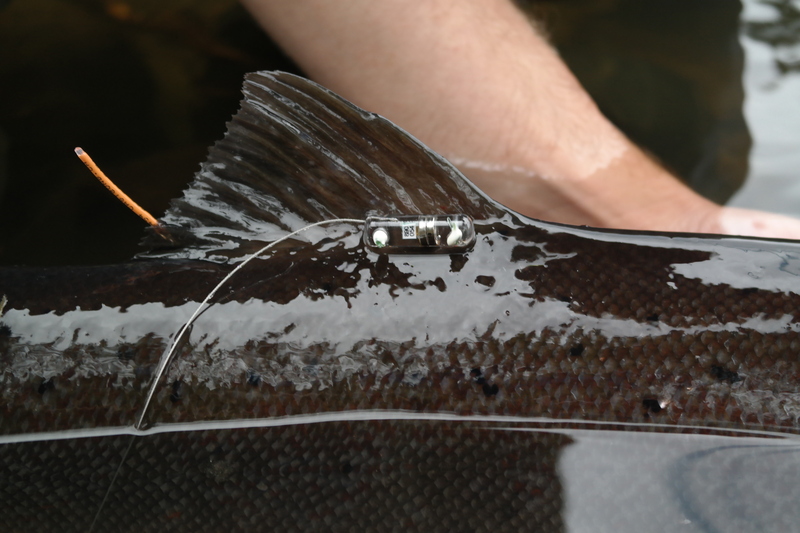 Adult salmon with a encoded, orange Floy tag implanted in back of the dorsal fin, and a radio tag with antenna installed on the near side. All released fish were equipped with radio, PIT, and visual floy tags. (radio and Floy tag picture) These tags each serve a slightly different purpose and provide redundancy in case of a failure of one or both of the electronic tags. Radio tags broadcast a signal that can be detected from hundreds of meters away, and they will function until the battery runs out. The PIT tags have no battery – their response is powered by the signal coming from the receiving device – and thus they last indefinitely. PIT tags, though, have a very short detection distance, and since they do not broadcast a signal it is much more difficult to locate fish with these tags. The Floy tags are just for external identification. Additionally, size measurements, scale and fin clip samples were taken. Through DNA analysis, fin clip samples will allow the assessment of that individual’s parental origin, if the fish is found in following years. Size measurements of adult fish are used to calculate the number of eggs that might be deposited in the experimental stretch. While the age of the SAS fish being released is known exactly, the scale samples from the wild fish allows their age to be calculated also. When the adult fish were released the females were ripe, and perhaps some were over-ripe. This was due to the late approval of the project. Fish started spawning the first night they were released, so they didn’t migrate far nor have adequate time to adapt to the different temperature of the stream and recover from the shock of transfer. However, some successful spawning did take place in the ER in 2017. CAST staff manning antenna to track tagged salmon in the ER. The adult fish in the ER were monitored throughout the entire spawning season via active radio tracking. The behavior of the SAS fish was documented and spawning redds were marked with GPS points. The barrier fence was removed at the end of the spawning season to allow the outmigration of fish from the experimental part of the river. Stationary radio antennas were used to observe post spawning outmigration from the ER into the tidal zone of the Miramichi River. During the summer of 2018, an electrofishing survey was conducted in the experimental river stretch to examine the reproduction success of the released SAS fish. A total of 111 fry (0+) were sampled for parental DNA analyses. The results of the analyses will provide exact information on the individuals status; groups (wild female cross wild male; wild female cross SAS male; SAS female cross SAS male; SAS female cross wild male). Additionally, 101 of the caught individuals were equipped with a PIT tag. The tagged juveniles will be monitored for 3 years. Kayak equipped with tracking antenna to look for salmon that can’t be followed on foot. 2018 In the autumn 2018, a total of 40 SAS and 40 wild fish were released into the experimental river weeks before spawning commenced. All fish were sampled for scales and fin clips, and received the same tags as in 2017. The fish were again monitored throughout the entire spawning season. Stationary radio antennas are used to monitor the final outmigration into the estuary, as well as the survival success until spring 2019. 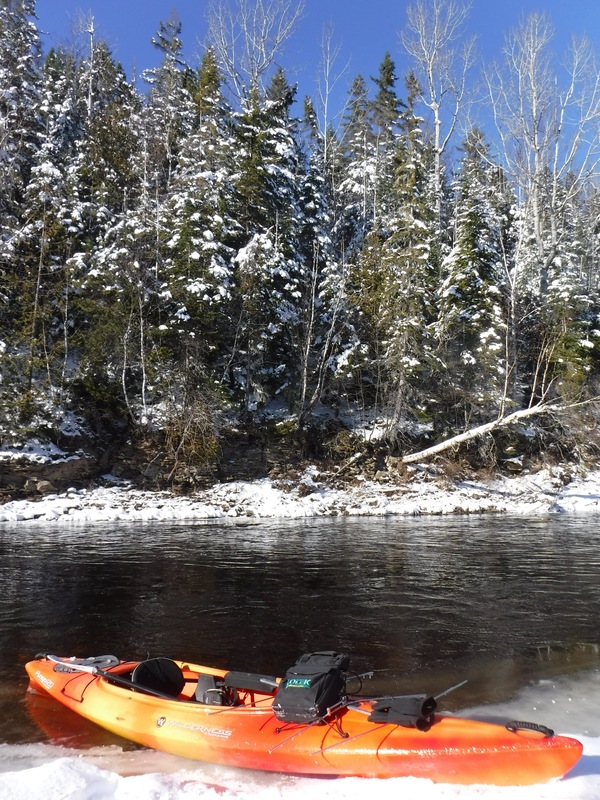 (picture here of Kayak on ice) The radio antennas are not 100% reliable, and not all the fish have been accounted for yet. But it is known that numbers of both the wild and SAS fish did survive spawning, and that both groups of fish behaved similarly after breeding was over. No adult fish stayed in the ER to spend the winter. Salmon redd in ER fall of 2018. 31 spawning redds were found after the spawning season of 2018. (pictures of redd) The total number is potentially much higher. Towards the end of the spawning period, high waters and accompanied turbidity did not allow the mapping of additional redds. I ran into this same problem myself on the Cains River this fall when the water was too high to either observe spawning or redds. 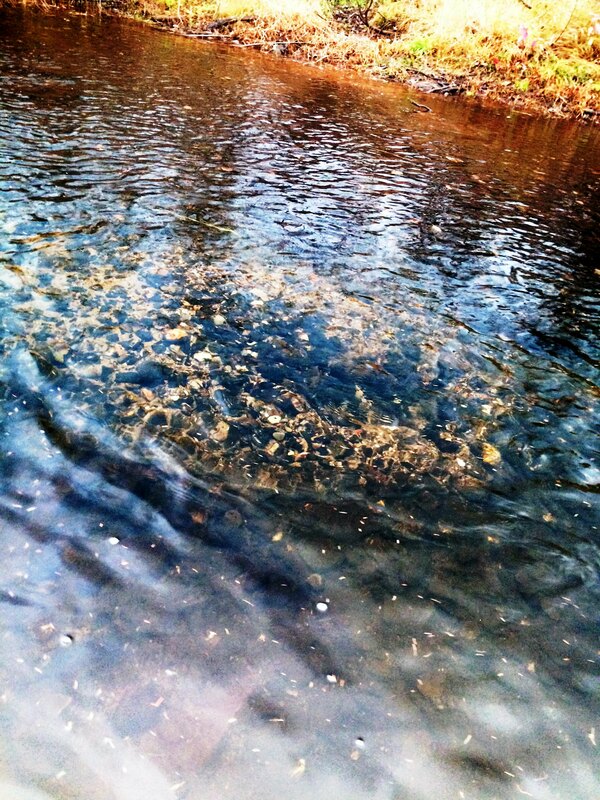 During the field season, though, SAS and wild fish were observed performing various interactions, including spawning. This underwater video taken by CAST technicians documented a male SAS salmon spawning with a wild hen. The reproduction success of the released individuals will be examined in the spring of 2019 via electrofishing surveys. DNA samples will determine the total number of progenies of the different cross groups (wild female cross wild male; wild female cross SAS male; SAS female cross SAS male; SAS female cross wild male). Once again, these parr will be equipped with PIT tags. The development, habitat use, and survival rate of the fry spawned next spring will then be observed for two years – when they leave and go to sea as smolts – together with the parr from the adult release in 2017. Expectations from evidence so far are that fry resulting from wild spawning of SAS adults, and cross groups of SAS and wild adults, will all be equally viable and have the same odds of living to become smolts, migrating to the sea, and eventually being among those that survive the ocean migration and return to the river as adults. The video below was filmed in the ER on October 19, 2018 and shows a SAS male salmon spawning with a wild female salmon. The video is only one minute long, have patience that best part is the last 20 seconds. Follow CAST and SAS – this link https://twitter.com/unbsalmon has photos and videos, and is consistently updated with additional information on the CAST program’s salmon research and efforts to bolster the Miramichi salmon population. What is the impact of the large seal population in the area? Based on my experience in Chatham MA, the seal population can expand significantly when their predators do not increase in proportion resulting in an ‘unbalanced’ affect on seal prey. Granted the definition of ‘unbalanced’ is subjective. Brad, I was encouraged by reading about the use of the ARIS sonar fish-counting system in the Miramichi — finally! This is the 2nd generation of the sonar system (the 1st was DIDSON, same manufacturer) the latter being in use in Alaska for around 20 years. I have suggested using it to Canadian officials and the excuse has been that sonar can’t tell the difference between species. This is true, but “resolution” has been improving quickly, and also, ARIS, when used with other manual systems (redd surveys, angler surveys, camp records, etc. ), can yield some fairly accurate fish population estimates. I also wonder why DFO and other Canadian officials haven’t gone to their Fish and Wildlife counterparts in western US and Alaska to study some of their conservation techniques, and maybe “borrow” some of their biologists for awhile. While our Western Fish and Wildlife Departments are far from perfect (in California, Oregon and Washington), however, from what I know about both efforts to conserve salmon, I would say that CAST and SAS programs and strategies are about 15 to 20 years behind the efforts of their counterparts in Western US. I realize this is being rather blunt, but it should be said and it is the truth — which is more important the ruffling a few feathers. your notion that SAS program in Canada is about 20 years behind is about correct. No worries about ruffling the feathers. In fact, although there occasionally is the Freudian slip that the SAS strategy is “novel” or “new”, it indeed is not true as Idaho has a 20-year assessment report on success of such program. We (“collective worldwide science”) know a good deal what to expect about such program; that is why our opinion has been that this should be the way to go forward; however, others disagree. The CAST group arranged an international workshop regarding SAS strategy in 2016 and we are in the process of writing a “state-of-art” scientific article regarding this conservation strategy with key participants. We had two US scientists in Fredericton, NB, for 3 days to discuss, give various presentations and to have an opportunity to chime in on our proposed program. They are also to be co-authors of the article we are writing; Dr. Berejikian from Washington (NOAA) and Dr. Christine Kofzkay from Idaho (Idaho Fish & Game). So, we are in a good working relationship with the knowledgeable personnel from the Pacific Northwest. We have taken the work they have done, and based on the scientific review meetings (in Canada called CSAS process), identified the “still need to know these things” parts, and proposed, and in part implemented (as described in-part in Brad’s blog) a multi-year program where to answer some of the still remaining questions such as the life-time fitness of SAS vs wild progeny. However, we have had difficult time getting some parts of these programs permitted by DFO, and have been cited various issues as the reasoning, including whether the salmon population in Miramichi is in any kind of a trouble (Note; based on DFOs new limit reference points, the “health status” of Miramichi River salmon population has “changed” in that it appears the Miramichi, overall, is concluded by DFO to “be just fine”, at least in 2018 egg deposition was exceeding the number required to meet the new limit reference points. [Further note, I am just reciting what my understanding is from DFO; this is not my personal opinion, but I am not entitled to one as I have nothing to do with A. salmon management. That is the responsibility of the DFO]). Currently, local stakeholders are in further dialogue with local rightsholders and the federal department regarding how to proceed in the program; such dialogue is important and welcomed. The academic members of the CAST consortium (at the University of New Brunswick) are staying tuned to see whether we will be provided a further opportunity to examine this strategy further by monitoring outcome should a program be implemented by the local stakeholders and rightsholders beyond the Experimental River and the laboratory work we (current CAST members) are currently allowed to undertake. We (CAST) cannot implement the program if 1) it is not required (i.e. the river is considered by DFO to be “fine”), or 2) if it is not wanted (i.e. local communities think risks to do something exceed potential benefits). Anything releated to A. salmon tends to be fairly politically loaded, and one can only help if the help is perceived beneficial. But in brief, we are quite well aware of the state-of-art so far and are building upon the lessons learned in the Pacific Northwest. We agree there is a lot of great work that has occurred, however, we were hoping to fill some of the remaining knowledge gaps should a SAS program be realized in the Miramichi. That is yet to be seen, and perhaps it will be decided there is no need to monitor an outcome. CAST was willing to meet all the mitigation requirements, however, to date the program implementation is still waiting approvals. It is interesting to see how future unfolds in the Miramichi, as many people, including myself, remain quite conserned about the status quo of the salmon population in the river. Thanks for your encouraging reply — words now need to be translated into action !! Thanks for the detailed report on the current status of the CAST program. It is baffling and extremely disappointing that DFO is dragging their feet on supporting this initiative. Most wildlife agencies in the US are struggling to keep programs running and welcome credible, scientifically based assistance from outside organizations, particularly when it involves imperiled species. I can’t imagine why they would not take the same approach. Echoing Jack above to say thanks for writing such a clear, level-headed explanation of the situation. It can be challenging, amidst all of the hyperbole and politics, to get at the core of the issue and to appropriately balance the need for more information with the need for action. Much appreciated, and hopefully we are not too late. I am a local Miramichi’er, avid fly fisherman and someone who likes to see/read both sides of the coin on all issues. Otherwise, we are just feeding our own confirmation bias, which happens a lot and gets us nowhere. I was personally against the CAST program until I read your blog. I was (and still am) very concerned that raising salmon in concrete pens until they are ready to spawn could weaken the gene pool when they breed with another SAS and/or wild salmon. I am now a bit on the fence with where I stand. Although I am still hesitant about the impacts of SAS salmon interbreeding with wild salmon, I have a much more open mind, now that I fully understand the steps that are being taken. Also, reading about the small sample size and the rigorous tracking being done to see how the progeny of SAS adult salmon fair on their journey to the ocean, it settles me a bit knowing there appears to protective measures in place. I do find it VERY INTERESTING that two of the funders for this project are JDI and COOKE aquaculture. A bit ironic, don’t you think? Both of these industries are helping decrease our wild salmon populations. However, I understand how research works, and it takes HUGE grants and funding from industry to help foot the bill. Can’t bite the hand that feeds us, but maybe we should if they are playing a role in the detriment of our wild salmon populations. My final concern is that the real problem that has been reported over and over and over again is smolt survival in the ocean. We need Greenland SHUT DOWN 100%, and not just the commercial fishery shut down; we need the entire fishery shut-down! Until this happens we can do all we want with CAST, MSA, Catch and Release, etc., but we will forever be fighting an uphill battle that we will never win. Huge steps have been made shutting down half of Greenland’s quota, but they are still taking 20 tonnes for subsistence. I REALISE THAT IS NOT WHAT THIS ARTICLE IS ABOUT, I JUST FEEL THAT IT IS AN ISSUE THAT NEEDS MORE ATTENTION. I DIGRESS…. It will be VERY interesting to see how this project fairs. I hope it does well and can help our salmon return to sustainable numbers for my children and grandchildren to fish; however, I will embark on a “watchful waiting” stance, as I always am concerned when humans try to implement human interventions in wild ecosystems. It is like we are running around putting bandaids on everything when the solution is for us, humans, to step back and let nature heal itself. But until we shut down massive clearcutting, spraying, and offshore fishing, we will continue to jump from one cut to another, slapping on those band-aids solutions. I hope my skepticism is proved wrong and this program proves to provide a viable way to recover our wild Atlantic Salmon here on the Miramichi. John – thank you. I came away from my research with a high degree of faith in the people running the CAST program. I also know that with few and perhaps no exceptions they are passionate fishermen themselves. Great info Brad. Thanks. I agree with everything proposed, EXCEPT the assumption that adult survival, and successful spawning, will be the same for the SAS crosses as with wild/wild crosses (progeny). Fish that have some SAS parents will have reduced survival. Will be less likely to raise successful progeny. Diluted instinct = reduced survival. This program should be kept far away from rivers with viable wild populations, because it will cause more harm than good. Good work Brad- Thanks for your interest in our river/communities/families. in the spring of last year also stating that stocking programs should be used as an absolute last resort when the population is approaching extinction. We are not there yet in Miramichi. Far from ideal, but far from extinction. My life on the fence was short-lived. Stocking weakens the gene pool and lowers survival rates. It is the opposite of survival of the fittest. We are going to look back in 20-30 years and realize the damage we did mixing concrete salmon with wild ones. Thanks for your work, Brad. Regarding John’s concerns that stocking works against the survival of the fittest and weakens the genetic diversity and strength of the gene pool; The stocking programs that are criticized in the article he cites bear very little resemblance to the experiments being run by CAST. Moreover, CAST is monitoring the results of its work to determine the effect on both the fitness of the resulting fish and the genetic effects, if any, on them. The SAS program is best described as a controlled experiment, and certainly not a fish farming stocking program like the ones criticized in the ASF article. It is certainly possible that the program will conclude that SAS damages the salmon gene pool; it is also possible that it will provide proof that the genes and fitness of SAS fish are indistinguishable from wild fish. It may also produce other important new and unexpected knowledge. In any case, the conclusions will be founded on sound, replicable experiment, and further the cause of salmon conservation.